Image caption HMRC said the arrests showed it would catch those who tried to "cheat UK taxpayers"
Five men accused of stealing personal data to carry out tax rebate fraud worth £500,000 have been arrested, HM Revenue and Customs has said. They are accused of setting up false self-assessment accounts from June 2012 with the aim of stealing rebates. 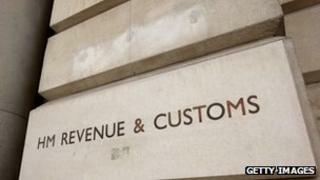 HMRC said its "online systems proved extremely resilient to these attacks". The men were arrested in London, at Stansted airport and in Chatham, Kent. One has been charged with cheating the Revenue and four have been bailed. HMRC spokesman Andrew Sackey said: "HMRC's online systems proved extremely resilient to these attacks - they correctly identified and prevented the vast majority of false repayment attempts from the outset. "These arrests clearly demonstrate that we can, and will, apprehend those suspected of attempting to cheat UK taxpayers by defrauding HMRC, with international assistance if necessary." The individual who was charged was detained at Stansted on Saturday afternoon after getting off a flight from Italy. HMRC said its investigators had worked closely with their counterparts in Italy to secure his arrest.